Every Friday I plan to do a “Friday Feature” where I will do a non-recipe post, yet the post will be something related to the health industry. It might be a fitness or health tip, a book review, a restaurant spotlight, etc. This first FF post is a restaurant spotlight. Before we review the restaurant, let’s go over some basic tips to consider when eating out. Here are some helpful tips to consider when placing your order at restaurants. Remember to eat a reasonable portion. Most restaurants serve double or triple the recommended portion amount. To avoid eating everything in front of you, as for a to-go box to come out with your meal. When your meal and to-go box arrive, immediately place half of the meal in the to-go box to eat at a later time. Food combinations are important to consider. A healthy meal will generally consist of a portion of lean protein, a complex or starchy carbohydrate, and vegetables. When looking for meal options, be sure to look for something that meets this criteria. Beware of added complex or starchy carbohydrates as most restaurants sneak these in where they can (for example: chips & salsa, bread baskets, popcorn, rice, black beans, etc.). We generally should only eat one complex/starchy carbohydrate per meal. Avoid extra oils and butters. Most restaurants cook EVERYTHING (and I mean everything) in oil and/or butter. Did you know that before a steak is served and nice slab of butter is placed on top of it to melt as soon as it comes off the grill? This is the case with most items on any restaurant’s menu. SO, when placing your order be sure to remind your server that you would like no butter/oils on any part of your meal. And, if possible, have your meats grilled. Avoid dressings, condiments, cheeses, etc. that are packed with calories and fats. Ask for reduced fat or fat free dressings/condiments and always order dressings and condiments on the side so you can control how much you really eat. Get used to making special requests. Study the descriptions of menu options and be ready to tell your server what to leave out of the dish. You may need to order a Southwestern salad without cheese or tortilla strips (remembering to ask for a vinaigrette dressing on the side). You may end up ordering a grilled chicken sandwich with no mayonnaise. In summary, order smart by eating the right portion size for you, staying within your calorie limits, and following the proper combination guideline. Now. . . on to our restaurant spotlight of Rumbi Island Grill. Rumbi has some fabulous healthy options that allow us to stay within the guidelines above. I took my beautiful mom to lunch earlier in the week and we made great choices. My mom ordered a rice bowl. 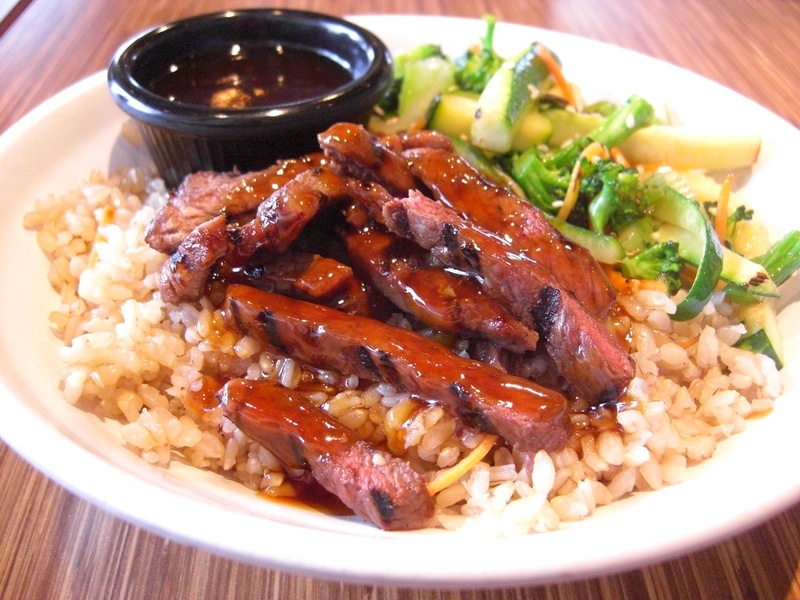 At Rumbi you have your choice of meat (steak, chicken, or shrimp) and you can actually order brown rice with it. Hooray! As you can see, it comes with vegetables too. The only semi-scary part about the rice bowls is the sauce. So, in following the guidelines above, always request the sauce on the side and use the very least amount you can while still enjoying the meal and the flavors. You’ll want to make note that, true to restaurant form, the serving of the complex/starchy carbohydrate (rice) is much larger than the typical person should truly consume. So, eat half of the rice and take the rest of it home. Rumbi even has to-go boxes right on the condiment bar, so you can grab one before you start eating, place half of the rice in the box, and then gobble up what is left in your bowl. Genius! I ordered this Voodoo Chicken Salad. Ordering salads can be scary. 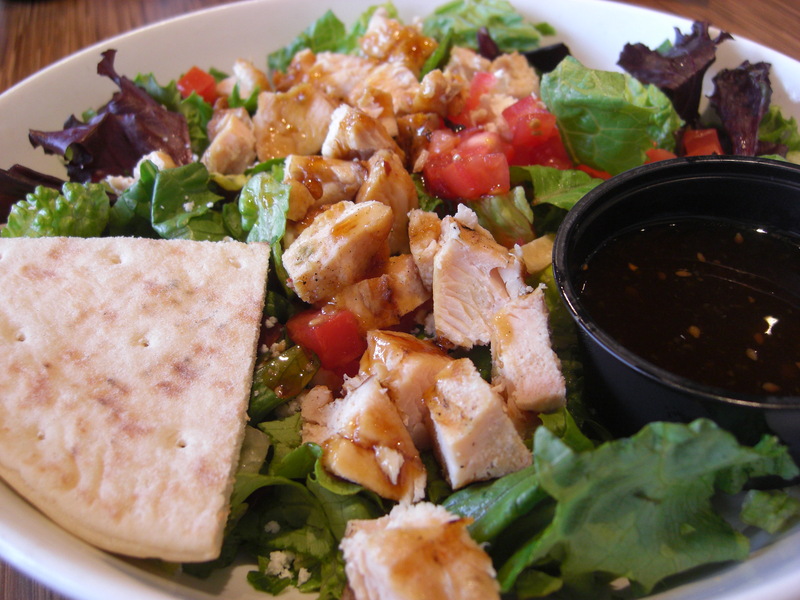 They always seem like the perfect thing to order, but most restaurant really know how to add fat and calories to salad to make them really taste awesome. When I order salads I get very picky. Like most things, I read the entire description of the salad so I know what to ask the server to leave off it. In this particular instance, the only things on this salad that I needed to be removed were the tortilla strips. I then asked about the dressings they offered. Even though most of the dressings on the Rumbi menu say they are vinaigrettes, I wanted to be sure they were reduced fat or fat free. Come to find out . . . they only have one dressing that fits this requirement. It was the Sesame Ginger Vinaigrette. I ordered that one (on the side of course) and I loved it! Last, but not least, I reviewed my salad to make sure I had a lean protein, vegetables, and a complex/starchy carbohydrate. If I count the pita wedge as my complex carbohydrate, then all requirements are filled. The pita isn’t preferred as it is white, and it’s not very big. So, when I really want to get picky and know I have truly satisfied my food combination requirement, I ask to have black beans added to my salad and Rumbi happily obliges. This is truly one of my very favorite salads at Rumbi. Now that we know all the ins and outs of restaurant ordering (and we know of a fabulous restaurant we can go to), let’s make tonight a DATE NIGHT, shall we!? I love that! I am always tempted to eat more than I should, and I love the part about putting half in a box before you begin! I need to start ordering my meals like this!